Hi everyone, thanks so much for joining us today. I’m Summer Tucker with NSR Invest, and we’re also joined today by Bo Brustkern of NSR Invest and Joe Besecker, the Founder and CEO of Emerald Direct Lending Advisors. Today we will be discussing the future of Lending Club. We’re going to go ahead and start with the most exciting part – which is the disclosures. A couple of quick things to note: neither Joe Besecker nor Bo Brustkern own stock in Lending Club, and we are not making any recommendations about buying or selling Lending Club’s stock. We’re just discussing the Lending Club news as it has been reported and affected the industry. We’re also providing the viewpoints as to where Lending Club’s marketplace lending business will evolve from here and its repercussions for marketplace lenders. So, quickly let’s go over the agenda. First, we’ll hear from Joe, who’ll make a quick introduction about himself. Then, Bo will take over to introduce himself. He’s going to talk about what happened at Lending Club, do a quick credit analysis, and then we’ll turn the floor over to Joe, who will talk about the company and industry analysis. After that, the floor will be opened to questions. If you have a question, please just click the ask button, that’s in the lower right-hand side of your screen. We’ll take them on a first come first serve basis. If you have any question, go ahead and email me. I’m Summer, Summer@nsrinvest.com, and I can try to help you out throughout the presentation. Hope you guys enjoy it. Hey, everybody, it’s Bo here. I’m going to kick it off with an introduction about myself. I’ll introduce Joe as well, but just to be mindful of everyone’s time let’s get started. Thanks for joining! We appreciate you coming in such great numbers to hear about what we have to say about the marketplace lending industry, about Lending Club, about the fallout, about what goes on from here. Again, I just want to underscore, please just keep in mind that what Joe and I have to say today are just our opinions. We’re market participants, we’re both investment advisors, we represent different firms, and we’re just really here to help the audience sift through some data, and present some of our findings. We’re not making any recommendations at all about buying or selling Lending Club stock. Our only interest as investment advisors is to ensure we’re guiding our client’s capital in the wisest way. Joe founded his firm, the original Emerald Advisor, back in 1991. He later founded Emerald Direct Lending Advisers, and that is the entity that is building its marketplace lending investment thesis. They have a number of clients, primarily on the institutional side, but also on the family office side. I’ll say, Joe would probably be too humble to say this, but I love Joe as an analyst. He is what I’ll describe as analyst’s analyst – asks the hard questions, gives the raw opinions, and I think you will appreciate his perspective. Myself, a long time finance guy. I started building a thesis around marketplace lending as far back as 2010 but didn’t start guiding client principal into marketplace lending investment until 2014. I spent a number of years doing due diligence on this space before guiding a single dollar into it. I’m currently, a co-founder and CEO of NSR invest, and we’re a fiduciary as an investment advisor. Primarily, we just care about our client’s capital – in making sure that it’s being invested wisely. So we’re going to blast through this part. Again, in the interest of everyone’s time let’s get started. First, let’s talk about the events that took place that led to this issue at Lending Club, and the corresponding fall in the stock price and so on. There were people inside Lending Club that changed data that went out to investors; that’s bad. The former CEO of Lending Club apparently did not avoid conflicts the way that we would expect. That’s also bad. So, these two things came out in public and equity investors reacted. We’re going to talk about that reaction and what happens here. So I think it’s enough said on the background, let’s move on to the next slide. What happened really, post-revelations on May, 9th when the press release went out, and we all heard about Renaud’s resignation as CEO. The immediate reaction was that the big institutional investors just withdrew. They stopped buying loans from Lending Club until they could re-assess the investment thesis and essentially re-conduct their due diligence. On the left-hand side of the screen, you can see the last 12 months of loan listings available on the Lending Club platform. The blue line is whole loans, the red line is fractional loans, and you can see there’s some volatility in them; there’s some big jumps, but generally you can see whole dotted red line that’s fractional, it’s pretty stable. It has turned slightly up in whole loans, slightly down from the fractional side as the company pushes more to the whole loan category to step up its growth, in my opinion, to meet the wall street’s expectations. Then you see the vertical dotted line right there on the right-hand side of the chart, and that’s approximately May 9th. After that, move your eyes to the right-hand side of the screen, where you can see a zoomed in picture of what happens: available whole loan listings drop off quick because the buying essentially comes close to ceasing. There’s activity but it’s very light. Then, 30 days later, you see that spike in the whole loans. It kind of jumps right back up and this chart brings us all the way out to yesterday, and you can see that there’s a possible rebound in terms of whole loan buying. You can also see that the fractional side is relatively steady; it does appear to drop off a little bit in terms of listing volume, but it’s generally very stable. What’s happening outside of the listing volumes? The stock price corrected pretty materially to a low of $3.51 on Friday the 13th. Now, as of yesterdays the stock closed at $5 even. An investment group out of China called The Shanda Group, bought a bunch of Lending Club stock and the first announcement came out really close to the original announcement. There was some opportunistic buying in the equity markets and then further buying. So they’re now, as of yesterday I believe, or last week about 15.2% ownership in Lending Club – and that’s on the equity side. 18% say I’m going to stop re-investing. How many people actually do stop re-investing? And, how many of them are just uneasy about this at the moment? So we think that there’s about a 50% drop off there. Now, in our own experience at the NSR Platform – again on the retail side, we have had less than 1% of clients exhibit a behavior change, and we think that may be because we’re a third party. Our clients are potentially more confident in their holdings in Lending Club than the average retail investor. That’s just a guess – we have done no research to understand the difference there, but we have noted the difference. Also of note, we’ve seen our assets on the NSR Platform go up consistently both in May and June and on the retail side and also the number of users on our platform has gone up pretty materially. The last point is on the fractional secondary market, which is run through FolioFN. There has been a big spike in available loan listings for sale in the secondary market, but volumes are still quite small. It used to be in the $10 million per month range; it’s been a material spike, but it’s still in the $20 million range. And, compared to the total outstanding principal in the fractional market, that’s a very small piece of the holdings. So what’s happening right now at Lending Club? We understand that the company is rallying around Scott Sanborn. Scott is the acting CEO. There’s a lot of confidence within Lending Club, and I think outside of Lending Club in Scott’s capabilities. He’s been at Lending Club for quite some time. He began as an executive of course, but he’s come up through the organization. He has run two major aspects of Lending Club’s business – building the institutional investor group which is fundamental to Lending Club and also he has run operations. So he gets it. I think he knows how to run a company. He’s charismatic and very intelligent, so the company, in my perspective is in very good hands. I believe the company, the folks at Lending Club, are rallying around him for good reason. So again, sort of opportunistic buyers on the institutional side, but also a real re-commitment to retail. I think retail has been loyal to Lending Club through this crisis, and Lending Club has always said that retail is always important to them. And, I think they’re very happy that they have that strong retail base, and I understand that it is quite a re-commitment to that retail base and growing that retail base. Staying on slide 9, this is a chart that comes from our friends at MonJa, which is a data analytics company specializing in the marketplace lending industry. Focus on the green line, which is blended between Lending Club and Prosper, 30+ day delinquency measurement – and it’s been pretty flat. This is backward looking, and it only goes to 2016, so we’re not seeing real-time data on how the credits are performing as of today, but you can see that the credits are generally performing reasonably well. Data on the next slide comes from Insikt, which is another data analytics firm, again, focused on the peer to peer lending industry. This chart actually includes the first quarter of 2016 data, which of course is going to be just barely lifting off, again it’s really early with peer to peer lending or marketplace lending, to tell how the credits are going to perform. However, as you can see all the lines that are stacking up here in the quarterly cohorts are following the same pact – there’s no big surprises here. Now again, in marketplace lending, we have to wait for a considerable amount of time to see how the credits end up performing, but there’s no immediate signs of danger in terms of the credits that were issued in the quarters since 2013, and before that as well. On the next slide, we have data again going into the 2016 Q1 end from NSR platform. This is the technology that we own and operate. I have to explain the charts here because they’re very interesting. The top chart is all 2015 cohorts, and then the bottom chart represents 2016 Q1, so pretty early indications of performance, since again, we’re just halfway through 2016 now. In the 2015 vintages, you have on the left-hand scale; it’s the ROI – the reward. So the higher the bubble appears, the better the ROI for that cohort. So C-grade 2015 vintage, you’re getting a little bit north of 8% blended return for that whole loan grade. Now, on the right-hand scale that’s the standard deviation of returns across that loan grade. The further right you go, the more variance in returns. Generally speaking, you can see the lower the reward, the lower the risk, and vice versa. However, there is a little bit of curve there on that E-grade line; that’s interesting. Next, the color is the principal amount of charge-offs – red being worse, more charge-offs and green is less charge-offs. Finally, the circle radius is the volume of loans in each of those buckets. So really interesting chart here, again coming out of NSR platform and the one highlight that I would make is actually just the percentage of loans coming out of the fractional pool. Of all 2015 grades from A to E only, 34% of the loans appeared first on fractional and the balance first on the whole pool. Now if we go to the first quarter of 2016, that number dropped to 14% fractional and again going back to my earlier comment, I think that’s because Lending Club has pressure to originate loans. Originations are a part of their revenue stream; origination fees are actually the majority of their revenue stream. As they grow, necessarily they grow on to the institutional side. Now as I’ve said, the fractional/retail pool is very important to Lending Club. I do not believe in any way that they’re abandoning fractional; this is just a matter of: “hey we’ve got to grow this platform, and we’re going to do it by tapping into more institutional capital.” So a hick-up in institutional capital does make an impact for Lending Club. Now, let’s move onto slide 12. This is just a kind of reprise of what we talked about earlier. It plots Lending Club loan listings versus Prosper. This is the first time I’ve mentioned Prosper, which is the primary competitor to Lending Club. And you can see Prospers’ loan listings are fairly similar through the Lending Club crisis, and then you can see the Lending Club rebound on the right-hand side. Let’s move on to slide 13 and let’s hope that Joe has had enough time to get his mic working. If so we can dive into some discussion here between Joe and me and then take it from there. That’s a relief. I think we’re having some technical difficulties, so I didn’t hear any of your introduction and much of what you said because I’ve just pulled in here for the last 30 seconds. So why don’t you give me updates as to where you are and what we need to talk about? Yeah so, I’ve just given a lay of the land – the industry backdrop on the decline in loan volumes, what looks like a rebound in loan volumes, and we’re going get right into your thoughts and opinions on this space generally. I mean you know all the data that I just presented, and I think there’s nothing you need to be prepped on. Over the last few months or so, and actually prior to that, by way of introduction we are a money management firm for 20 years. We have a very strong record being small in the cap companies and even prior to coming public, we followed what was going on with Lending Club, Prosper, and the other platforms. A number of years ago, we acquired an outfit that actually was an asset manager in the space, and we’ve been doing it now for close to three years. So we followed this space, but this is very similar in a way to other sectors that have had high growth – hockey stick like growth — there’s always a snap back of some sort. Whether it be Biotech or Fintech, you could even say in energy fracking. So many spaces have this meteoric growth, and then things happen. 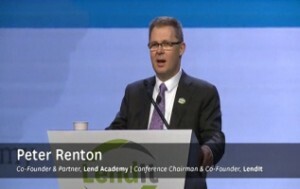 If you look at the internet days, the most recent LendIt Conference reminded me to reconstitute those days. So, essentially our opinion is, this space is an extremely viable space and we think it will change what’s going on as far as the consumer lending business and in lending in general and we’re very excited about this. It does not surprise us that it has been a big hick-up, but it does surprise us as to how it happened. We’re not here to give/can’t give advice on the public companies in this space, but what I’d tell you is that overall we’re going to have to, our attorneys here, always talks about embracing regulation and I’d say that this whole business needs to do more of that – embrace regulation. It is difficult because it fits in between many different types of regulators and I think, in general, regulators like this de-marketization of credit, but there have been challenges. Especially when you have hyper growth like they have had, that proposes an even greater challenge. You and I, Bo, have talked about some of the challenges that I’ve seen – even just on common things like valuation and allocation. Again, we are not a platform; we buy portfolios of loans, everything from the highest of quality to the lowest of quality, but we primarily are staying on the higher quality side. The challenge is that there isn’t a secondary market, per se, right now and getting price discovery and valuation discovery is tough sometimes. Even with accounting, there aren’t the kind of standards that we typically see in our traditional business. We manage money in a mutual fund, and we are guided in the compliance side by the Act of 1940 – the rules came from 1940. Here, we have a business that kind of grew, boomed from nothing, and the rules were being kind of made up as they run along and they kind of adapted. However, this event that happened with Lending Club is a wakeup call to the entire industry: there has to be an embracing of regulation, and there has to be a concern as to the types of loans that are being transacted. Bo, you and I have talked a number of times. I particularly had a problem for a long time and spoke to management, at a lot of the top platforms. Platforms that also have their own advisors – that is a challenge for me. Whether they did everything 100% right or not, the appearance of having a platform create loans and having that same company, even though there might be a difference in the business name buy them has always been a challenge to me. I always ask them that they would prefer a third party like ourselves or someone else to do that. They were only buying their loans, and I think that gives a perceived conflict. Even if it wasn’t a conflict, I think that’s going to be one of the changes that we see going forward. I don’t believe that large platforms should have their own advisory, I believe that they should be mixed, I believe they should be buying the sectors with qualities from A’s to B’s or whatever the guidelines are, and they should be buying it from multiple platforms. So when you talk about the captive investment advisor, that’s different from the argument about having skin in the game, right? Skin in the game would be balance sheet activity, and the advisor is essentially in your mind and my mind if I can speak for you, it’s a competitor to us. We’ve been told that up and down, “hey look, we all play by the same rules. There is no front running, all that”. But I think what you’re saying and what I would echo from that, is that just the fact that it’s there creates a perception of conflict. And what you’re saying is that’s got to change, am I correct? That has to change. You’re correct, and I agree. I also believe that there are challenges when it comes to when the loan is made and then it is under written and is put into the trust. You were talking about skin in the game; I believe that has to change somewhat too because I believe the regulators are little concerned about this process and the idea of “rent a bank.” The banks that they go to are just flipping the loan – and that can be a challenge as well. I think that’s an easier problem to solve if we get more people and more entrance into that gate. So I think that’s a challenge that can be readily met. But all of these things – the way allocation goes, now people like the big buyers have raised their hands and they’ve stopped buying. Well, how did they get their allocations versus how you and I get them? It should be done on a rotation basis, it should be done in a way that’s fair and equitable for all players, and maybe it was, but I have no way of knowing that because I don’t have the transparency. This is something that’s always concerning, and I believe that as this business matures and as they get better rules, we’ll be able to see that, understand that and understand what the parameters are of somebody like ourselves as a fiduciary that buys these loans. How we can better understand what loans can we get, and target a higher yield than the index of loans. It kind of reminds me of the old days when the IPO’s were really hot, then how did those IPOs get allocated out? There’s only so much stock, and how does a Fidelity get anything that they want, and the smaller money manager gets absolutely nothing? I don’t think that’s necessarily fair, and I think they’ll figure these things out. These are common challenges for businesses when they are growing rapidly, so I don’t want to make too much of a big deal about this. However, on the other side of things, these are bugs in the system that have to get worked out so that these platforms will continue to be viable as they start to get through this process of embracing regulation. Then we’ll see them grow again. It’s been a challenge for us. For those that don’t know, when you try to do an institutional program, you first have to convince the staff, then their consultants, and then there board votes on it. So we’ve had several pieces of business that were already in the books; the board passed it, the consultants and the plan sponsor – the actual plan, have all approved it. Now, they put a hold on it and what they’ve said is, “we want to wait and see how this all comes out.” The fact of the matter is, I would strongly urge plan sponsors and consultants to do the complete opposite. I don’t believe that there’s another big shoe to drop, I believe that the business will start to understand how to regulate itself and that right now, from three years that we’ve been doing it, there isn’t a better time to be buying loans then there is right now. This is because I think there are better loans and allocations available, and I think that there is a way to be able to populate the portfolio with really strong paper. If investors wait, I think they’re going to get back to a normalized point where it’ll be much more competitive. So any other plan sponsors and consultants out there – I would urge you to look at this very carefully because I think now is a time people should be looking to buy. We’ve been working with all the platforms out there, they’ve been very receptive. Much more receptive, honestly than they were before. There’s been a little bit of humility and eating crow. And if they look at people like ourselves, Bo, you and I that are around here for a long term they’ll see that this is a good place to put businesses. I really believe that the people are really thinking about it or have been thinking about it, pension plans and what not, this is a good time as I can see. These problems and challenges are already being worked out. And I also believe there’s a lot of capital coming into the business. Lending Club had that 15% Chinese investor; they are a very serious player. I think that you’ll see other players like banks – more than traditional financial services companies come into this space. Additionally, I think that you’ll have the marginal players pretty much drop out because there’s just not enough money right there – not enough investment capital from the institutional or even the individual side to meet the demand for the loans, which is obviously 180 degrees different. On the topic of “now’s a great time to be buying loans”, the way I think about that is very similar. Back in the day, we would look at the Lending Club data and in doing our due diligence on the firm, we saw that approximately 90% of loan applicants that were coming to Lending Club not through a channel, but direct looking for loans, doing web search “how do I consolidate my credit?” “Hey Lending Club, great! I’m going to get a $10,000 loan.” 90% of those applicants were rejected. So they are only letting in this little sliver of borrowers, and that’s really attractive, and that tells me that Lending Club has its pick. Now fast forward to today, several weeks ago there was an announcement that Lending Club was tightening its credit – moving away from some material part of the loan pool that they had been serving formerly. They are just scaling that back because the performance wasn’t as good. Now if look at what happened since May 9th, when the market buyers that are coming in, the investors, shrinks dramatically. That gives Lending Club all the opportunity in the world to really tighten its credit, to put forward much more stringent lending guidelines. I would add that it is a better way to manage that flow than it would be to stop advertising and stop looking for new credit – which I’ve seen both Prosper and Lending Club do. I would say that that’s not the best thing in the world. I would tighten credit and make all the credits better, but I wouldn’t stop, because priming that pump isn’t as easy as starting and stopping. I know that the marketing budget has been shrunk tremendously, but you’re still going to want those quality loans as they come through, and I think there’s appetite for good quality loans. The only challenge, I will give you Bo, when you said, that they used to have the pick of the credit, is that “defaults are going up” and I’m sure there’s short sellers. I’m also sure there are people that are very interested in this. It’s not lost to us that the credit market has changed, it has definitely changed whether it be in autos or otherwise. I’ve been hearing that affinity credit cards which are the first to show weakness, have been showing weakness in payments. So I think that in general, credit has been a little challenging lately, and I think it will continue to be so. So when you’re buying now, now is when we have our pick. Before we were having to put money to work and having to go through a portfolio of loans that maybe were not as appealing before, now they are certainly very appealing. So we can buy better credits now, and that’s why I think it’s a good time. Yeah, any more statements that you want to make before we move on to Q/A? Summer, I’m sure has a bunch of questions for us. Okay. Summer, you want to feed us some questions? Q: “Does the Lending Club stock price along with the drama reflect the sustainability of Lending Club? Is this an institution that will last? Well, these are the things that both our lawyers told us not to get into a lot. I’m not giving an opinion on Lending Club’s stock price or its continuing viability, but I’m talking about the space. And, I believe that being a leader in that space, you can infer what you like. I believe that you’ve seen capital come into the space and I believe you’ll see more capital come in as well. They certainly had some missteps; how they handled those missteps, I’m not sure I agree with everything in that respect. However, I do believe that the space is viable, will continue to be viable, but will continue to have challenges. As I said, embracing that regulatory environment – that’s something that all the platforms will have to do, and I think that you’re starting to see that. I think some of the other platforms are already doing that. I believe that Lending Club got over their skis when it came to that, and I believe that they’re obviously paying dearly for that. The stock price has gone from whatever twenty down to some four at one point. I do believe that these platforms are viable, and you can still buy quality loans from them. Now, what is the valuation you may want to attribute to that? That’s going to be up to the individual investor. Whether it may be an institutional investor or retail investor, but I do believe they are viable and will continue to be as well. Again, I’m not a stock analyst, and I’m not holding myself out as a stock analyst of Lending Club, but of course, in the interest of our investors, we need to be sure about the viability of the platform that we invest in. I don’t have any concerns about the viability of Lending Club at all. I think it continues to operate well as a public company and possibly also as a private. There’s some opportunity that it gets taken out, I think that’s also a good scenario. Either way, Lending Club operates in the same way that it has been under the regulations that it operates. Whether the SEC, banking regulations, CFPB or others. Here’s the deal. We don’t know what we don’t know yet. I believe that we didn’t know some of the things that were happening that caused the management shakeup, and we don’t know the end of the investigation. They didn’t even know enough to conduct a full shareholding meeting, right? So making those types of decisions as a fiduciary, as somebody who’d want to buy the stock is incomplete. I think that they’re going to have to have some time to get all this information out. Then we can put a valuation on it; then we can make decisions. I believe right now you’re purely speculating, but do I think that the platforms existing out there will continue to exist and will thrive and do well? Yes, but what valuation. I can’t tell you that because I don’t have enough information needed to make an analysis. And, anybody out there that thinks they do, they’ve got a lot better edge than we, and we’re looking at it pretty hard. I think it’s a challenge; let’s talk about Lending Club specifically because they are the ones this call is about. Lending Club was a company that did a lot of things well, and then they did some things not so well. Where that balances out? We still have to find that out. We don’t really understand all of the relationships between the platforms and the advisors they were doing business with; the conflicts were there. We really don’t have all that information, and if Lending Club had the information, they’d have conducted a shareholding meeting. I think that they are still trying to find that out, I’m sure they are trying to find out everything. They have a very powerful board and soon enough, speculating before that information, is just that – speculation. This is, I’m presuming on the retail side. I’ll go ahead and comment on that. The availability of loans has shrunk as by nature of the issues at hand. So we are going back to that one chart I showed earlier. There’s volatility in the available loans – that’s just the fact of life for now, and I believe that those credits are very good and it’s a great investment opportunity, generally speaking. I’m not saying index the thing, but use your filters wisely, and I think those credits are, generally speaking, high quality. There’s going to be some constraints on the market for sure, but we think that Lending Club will work its way through that. I want to jump on your other comment and then I’m going to take it. When we first started, there were many more people that wanted loans than the money that was there, and then the opposite became true – more investor dollars than borrower demand. This is continually going to be a supply and demand issue – and it happens in every market. The bond market, the commodity market, the stock market, this is something that happens and especially in the mature market. So, I wouldn’t get all geared up if there are 236 today on the retail side. This will all balance out as it becomes a more efficient market, and we’ll be able to tell some more things. I think Bo, all the platforms are working to get better on transparency, we need transparency, and we need regulation. So don’t get too upset about what’s happening, just know that it’s never going to get worse. It’s going to move forward and especially with people looking at it with a strong eye. So don’t get too upset. Did you say never going to get worse? What I mean is that we’re never going to go backward with transparency. We’re always going to be moving towards higher compliance, more transparency, and more knowledge. The space will get more mature, and it will become more efficient. I don’t believe we will go back to a less efficient market as it grows. As it matures, it will become a more efficient market, and we can make better decisions. Things such as better technology, better information, in a faster and stronger way. And no, I don’t believe it will take a step back. It’s just like this webinar that we’re doing; we have some challenges now but it’s never going to get worse, it’s only going to move forward. I can’t agree with you though in having no concerns, because as I said, I don’t have enough information. They do have 600 million; they now have a pretty big investor behind them, and so I think that will help, but there’s no telling yet what the results of all these investigations are going to be. Until some of that comes in to play, I’m talking about Lending Club as a company – not as a platform. The platform is very strong, still working, still a tremendously good vehicle for us to work with. So yeah I agree with that, and they may need a financial partner, but as far as their liabilities out there, I don’t know enough to be able to say. Now, if you ask my opinion I think that they’ll be okay, but I don’t know that I can make a solid thumbs up because I have concerns. Q: You mentioned, “defaults going up.” How rigorous is that analysis? Does it control for pricing? What is the rate of change, worried? I mean, yes, the analyses are rigorous, and we have seen defaults going up, but up with a really attractive flow. Going back to the charts we showed earlier with the loss curves and thirty plus day delinquents. I think this is a very healthy eco-system, and the credits are still very healthy. Joe mentioned the credit cards default and so on. I think that’s data that is sailing – and we should be paying close attention to that. What’s my biggest concern as I go into peer to peer lending? That is, what’s the general economy? What’s the employment like? If unemployment spikes like it did in 2008, the defaults are going to go up – and we will see losses for sure. So I believe it’s not necessarily a time to sound those alarms, but we’re keeping a close eye on it, and that’s my fair share of the answer. To the balance sheet, there’s pros and cons. There are things that are concerning. I think the word that you were looking for is normalized. I think that you’re getting back to a more normalized state. We were at a very low default rate for a while, which is why I believe you have to have active management. I believe that as you look at those parameters, you can make and adapt. I’m not a fan of passive investing, whether it be in stocks, bonds or loans. Let’s go back to the time where we started to see challenges in the areas of fracking/oil and what not. It just makes sense that those areas are going to have other challenges that other areas in the country won’t. So I believe that we’re getting more normalized, and I believe that you should always invest. You just have to tighten your credit, ready your credit standards a little bit, and I think that if you do that if you challenge the people that do have an active side, I think you could be just fine. Q: “As a normal investor, what should we do in the future? And can you please share with us how you would invest on LC in the future? I’m just going to assume this is coming from an individual investor. Like Joe just said a minute ago, I don’t believe in passing investing. I absolutely anchor that. There are really two good ways to invest on the Lending Club platform or Prosper platform for that matter. One is, you do a lot of analysis, and you build a very strong investment thesis, and you build a credit strategy. You do that using toolsets like we offer at NSR invest. We call those self-directed investors that come on to the site, they build their own credit analysis, they create a strategy and then they put it to work. That’s one way to do it. The other is to trust a fiduciary. There are a lot of funds out there. Joe runs one; we run one, and then we have our separate accounts practice as well, where you say “No, I just want my little account. I’m going to put $30,000 into it, but I want you, NSR to manage it. You’ll be my investment fiduciary, and I want to pick the Balanced Strategy. I’m not going to go with the Assertive strategy, and I’m not going to go with the Conservative strategy. I just want a balance.” That’s a flavored ice cream that we serve, and we’re happy to do that. So I mean, you either do your work, do your analysis and you use a third party tool to do it, or you choose a fiduciary, and those fiduciaries are going to be for accredited or retail investors. Would you really want to buy only Lending Club loans that they have in just one portfolio? Wouldn’t you want to look at the best loans? It’s like saying, I’m going to go to the stock market, but I’m only going to buy energy stocks. You want to go; you want to buy a diversified portfolio of the best credits on each of the platforms that you can. I think it’s silly to have their own advisories – it should be a third party. There would be absolutely no conflict of interest at that point, and what you would do is buy the best possible loans that are out there. Somebody looking at them on a daily basis, that’s differentiated from somebody that’s making the loans and then buying them. I don’t agree with it, never have. The first time I met Renaud, I told him that. Maybe he’s on the call; he’ll know that I haven’t changed my strikes one bit. I believe that people like Bo and myself and the teams of quality people that we have looking at this from the technological side, from the credit side, the corporate governance side, and the compliance side, we’re better equipped than they are and that’s where people should go if they want good for themselves and that’s a sales pitch but it’s not really sales pitch. Do it with somebody else that’s doing it. I’m just telling you that it’s the better way. Joe, you can answer after I explain it for 15 seconds. On the retail side, the Lending Club platform has historically had a much more robust, fractional pool. So Prosper has been stuck at 10-15 million per month on the fractional pool since 2013. It hasn’t grown materially, hasn’t shrunk either, but it’s just harder to get money to work in Prosper. Also, Lending Club has started with retail, has really focused on retail for a long time and they’ve had a historically much stronger fractional marketplace. So I think that’s one reason people focus on Lending Club from the fractional and retail side. I’m going to get myself in trouble here. It’s like choosing between kids. The fact of the matter is that perhaps the new Lending Club will be a little more customer friendly. Lending Club had a lot of things going for it, but in my opinion, Lending Club’s outreach to the clientele and people like us was a challenge to them. Prosper was a much easier group to work with. Seeing that Lending Club had a lot of data that Prosper didn’t have, but then Prosper caught up. I think before the whole thing blew up, I felt that it was just as easy to buy and do stuff at Prosper than at Lending Club. So I will close and will just thank everyone for joining us. Thank you, Joe. So thanks everyone for joining. As I mentioned at the start that Joe is an analyst’s analyst and no BS type – love chatting with Joe about things going on in this industry and I hope you enjoyed it. I hope you found his thoughts challenging and thought provoking. So with that, I’m going to sign off. Perfect! I just want to let everyone know that we have several unanswered questions, so the speakers will be reaching out after the event, answering those questions. Additionally, you can always feel free to call us directly at the office – 720-259-0455. Again thanks for joining. Have a great day, everyone.